Eligible Candidates can Download SSB SI, ASI Exam Hall Ticket at the Official Website of SSB. 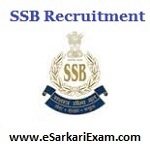 Applicants First Logon to SSB Official Website. Click on SSB Rectt Website Link. Open Admit Card for SI, ASI Post. Select Options and Fill Required Details. Open and Print Admit Card.